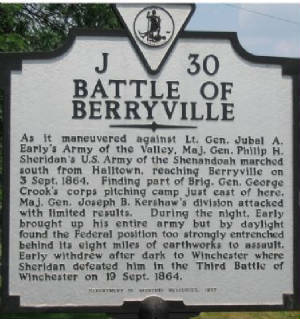 Setting the Stage: The Battle of Berryville was one of several battles fought during Sheridan's Valley Campaign (August – October 1864). Sheridan's Valley Campaign, part of the Shenandoah Valley Campaigns of 1864, was the last of three principal campaigns fought throughout the valley region. Battle: The Battle of Berryville was fought September 3 and September 4, 1864, in Clarke County, Virginia. It was fought toward the end of the American Civil War. After taking control of Smithfield Summit on August 29, Union Maj. Gen. Philip H. Sheridan marched to Berryville with his 50,000 man Army of the Shenandoah. At the same time Confederate Lt. Gen. Jubal A. Early sent Maj. Gen. Joseph B. Kershaw's division east from Winchester to Berryville. At about 5:00 p.m., Kershaw attacked Colonel Joseph Thoburn's division of the VIII Corps while they were preparing to go into camp. Kershaw routed Thoburn's left flank before the rest of the corps came to the rescue. Darkness ended the fighting, with both sides bringing in heavy reinforcements. The next morning, Early, seeing the strength of the Union's entrenched line, retreated behind Opequon Creek (Winchester). (Right) Historical Marker: As it maneuvered against Lt. Gen. Jubal A. Early’s Army of the Valley, Maj. Gen. Philip H. Sheridan’s U.S. Army of the Shenandoah marched south from Halltown, reaching Berryville on September 3, 1864. Finding part of Brig. Gen. George Crook’s corps pitching camp just east of here, Maj. Gen. Joseph B. Kershaw’s division attacked with limited results. 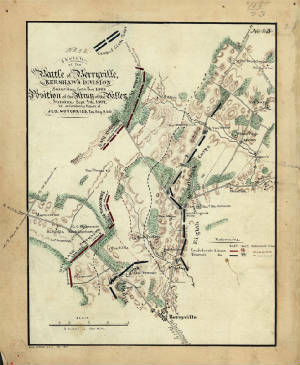 During the night, Early brought up his entire army but by daylight found the Federal position too strongly entrenched behind its eight miles of earthworks to assault. Early withdrew after dark to Winchester where Sheridan defeated him in the Third Battle of Winchester on September 19, 1864. Clarke County, during the Civil War, was known for its large wheat crops and it served as a Union supply route in the Shenandoah Valley. Berryville History: Berryville is the county seat for Clarke County, Virginia, and is located in the upper Shenandoah Valley, approximately 12 miles (19 km) east of Winchester and 11 miles (18 km) south of the West Virginia border. Berryville was founded at the intersection of the Winchester Turnpike and Charlestown Road. The land was first granted by the Crown to Captain Isaac Pennington in 1734, and George Washington surveyed it on October 23, 1750. In 1754 Pennington sold it to Colonel John Hite. According to legend, Daniel Morgan would engage in combat with young toughs at the intersection, having first piled large stones nearby to use as ammunition in case of need. Because of this story, and a rowdy tavern nearby, the area was first given the informal name of "Battle Town". Hite sold the tract in 1765 to his son-in-law, Major Charles Smith. Smith also named his estate "Battle Town", and on the site of the former tavern he built a clapboard homestead, which still stands on Main Street and is now known as "the Nook". Daniel Morgan returned to the area after distinguishing himself in the Revolution, living at Saratoga, and briefly at Soldier's Rest. He was one of the frequent (and reputedly most quarrelsome) patrons of the new tavern (where now stands the Battletown Inn). Major Smith's son, John Smith, in 1797 sold 20 acres (81,000 m2) of his inheritance to Benjamin Berry and Sarah (Berry) Stribling, who divided it into lots for a town. It was established as the town of Berryville on January 15, 1798. By 1810, the town had at least 25 homes, three stores, an apothecary (pharmacy), two taverns, and an academy (school). It was not much larger when it became the county seat of newly-formed Clarke County in 1836. Confederate Gen. Jubal A. Early briefly had his headquarters in the town, and not long afterward the Battle of Berryville was fought in and around the town during the Valley Campaigns of 1864, during the American Civil War. The railroad arrived in the 1870s. Sources: National Park Service; Library of Congress; Official Records of the Union and Confederate Armies; Gallagher, Gary W., ed. Struggle for the Shenandoah: Essays on the 1864 Valley Campaign. Kent, OH: Kent State University Press, 1991. ISBN 0-87338-429-6; Patchan, Scott C. Shenandoah Summer: The 1864 Valley Campaign. Lincoln: University of Nebraska Press, 2007. ISBN 978-0-8032-3754-4; Cooling, Benjamin Franklin. Jubal Early's Raid on Washington, 1864. Baltimore: Nautical & Aviation Publishing Company of America, 1989. ISBN 0-933852-86-X; Early, Jubal A., "General Jubal A. Early tells his story of his advance upon Washington, D.C.". Washington National Republican, 1864; Early, Jubal A. A Memoir of the Last Year of the War for Independence in the Confederate States of America. Edited by Gary W. Gallagher. Columbia: University of South Carolina Press, 2001. ISBN 1-57003-450-8; Gallagher, Gary W., ed. The Shenandoah Valley Campaign of 1864. Military Campaigns of the Civil War. Chapel Hill: University of North Carolina Press, 2006. ISBN 978-0-8078-3005-5; Lewis, Thomas A., and the Editors of Time-Life Books. The Shenandoah in Flames: The Valley Campaign of 1864. Alexandria, VA: Time-Life Books, 1987. ISBN 0-8094-4784-3; Mary Gray Farland, 1978, In the Shadow of the Blue Ridge, 158; Carrie Hunter Willis and Etta Belle Walker, 1937, Legends of the Skyline Drive and the Great Valley of Virginia, 26.